Most Rv owners have to deal with the question of choosing the right generator for when their RV is not plugged into shore power. This will inevitably lead you to wonder what kind of generator will best meet your needs: Propane, Diesel, or Gas? I have done some research on this subject to help you make the best decision so your next trip is a successful one. Propane generators are environmentally friendly, with clean emissions and a long shelf life. You can be limited by the size of the tank that you have, and propane can be more difficult to find in some areas. This could lead you to run out of fuel on a longer trip. Diesel generators are more common with people who have a diesel powered RV. They can produce more power than propane or gas, and diesel is safer to store since it is not explosive. However, these generators tend to be loud and expensive. They’re mostly used for commercial purposes. Gasoline-powered generators are most common as they are the most affordable and gas is very easy to find. However, safe storage can be an issue as gasoline is highly flammable and has a shorter shelf life than diesel. Your final decision as to which type of generator that you need is very important. Below I have compared these types in more detail and I have also included links to several popular models to assist you in your decision. RV generators can vary in many ways. They can be small or large, be more or less efficient, loud or quiet and so on. Experienced RV’ers know what parameters to look for when shopping for what they affectionately call “a genny”. Hopefully, you’ll be able to do the same soon! As we’ll go over them here, you’ll see why that classification tends to work well and reflect many of the criteria we just mentioned. These generators require a fuel tank outside of the unit itself, usually the same kind that you would get for your gas grill unless your RV is going to be in a permanent location. Then you could install a large tank that is refilled by a service truck as needed. Propane does not produce as much energy per gallon as diesel or gasoline. They are also not as easy to find as the gasoline or diesel. Or at least that used to be the case before you could shop for RV generators online. Most propane generators are usually more quiet, especially when compared to noisy diesel ones. That can be a consideration in the campground. Having said that, going for an inverted generator – regardless of fuel type – could be more significant if noise reduction is what you’re after. If you are going on a shorter trip, or have very limited power needs, then a propane powered generator may be a good option for you. It produces clean emissions and is very easy to store in portable containers. It has a very long shelf life as well. 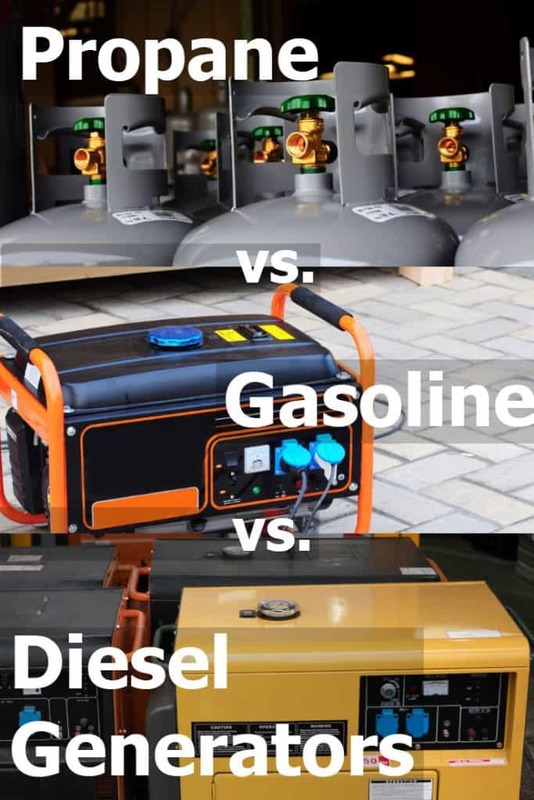 These are the most powerful generators and are a great option if your RV already runs on diesel, therefore you would only need one fuel source. They are more efficient as they create more power per gallon of fuel than gas and propane. Diesel burns more cleanly than gasoline, so these types of generators are more durable and don’t require much more upkeep than just starting them up once in a while. Diesel can be stored for a long time (longer than gas but not as long as propane) but in some settings, it might be harder to find. Usually – but not always – it costs more than gas. These are the most common types of portable RV generators as the fuel is widely available and less expensive than the other options. They create more energy than propane, but less energy than diesel. 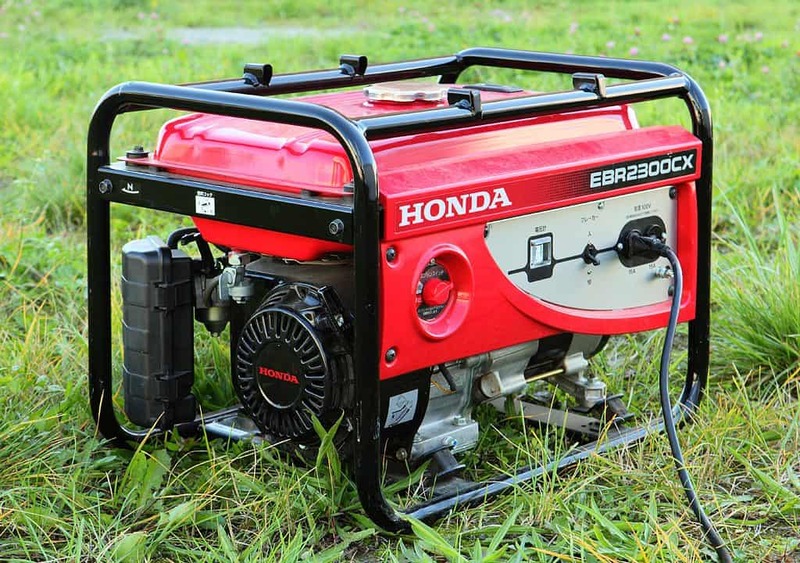 Gasoline powered generators require more upkeep and care than the others. Gasoline is a very flammable liquid, with a high flash point, so it can be dangerous to store. Be sure to keep any containers away from fire or other ignition sources. In terms of noise levels, gas gennies are a lot like propane ones. And for good reason. The engines are very similar (unlike diesel engines) and the main difference is in the carburetor (not affecting noise levels). There are also a few lesser-known options that are becoming more popular such as Bi-Fuel, Tri- Fuel and Solar powered Generators. Also referred to as dual or hybrid fuel, bi-fuel generators are typically found with a combination of propane and gasoline fuel. This type of generator allows one to take advantage of the environmental friendliness of propane, while still having the option to use gasoline if needed. Also called hybrid or multi-fuel, tri-fuel generators can be used in a more residential type setting for our RV, because they can be hooked up to a large propane tank or natural gas service, but can also be used with gasoline. Solar Powered generators are good for boondockers looking to live or vacation off the grid and not have to rely on a fuel source. They are limited in areas or climates where there is not a lot of sunshine and do not create power at night, however, the excess energy created during sunny days can be stored in batteries to compensate for the times when it is not actively generating electricity. So, which RV generator to choose – diesel, gas or propane? There are many considerations for choosing the perfect generator for your RV. Going beyond the type of fuel used, you should also consider size, type (inverter type or contractor grade), portability issues and of course, power output. Will you be using the generator often? If you plan on staying in campgrounds almost every night and relying on shore power 90% of the time, then you won’t be using the RV generator very often. In this case, diesel or gas can break down after prolonged periods of time and your generator could stall. A propane generator is a better option in your case. Will you be boondocking in the middle of nowhere for long periods of time? Or maybe even camping in your own private and very large backyard? If neighbors are not a problem, a diesel generator could be a good solution. It will be expensive to buy but will last you for years to come. What kind of engine pulls your rig? Many people prefer to rely on a single type of fuel source. If the RV is what’s known as a “diesel pusher”, they’ll lean towards getting a diesel-fueled generator. On the other hand, if they’re towing with a gas truck, a gasoline-powered generator has more appeal. Weigh your own specific situation and needs, and decide accordingly. Remember, you can even have more than one generator! And although these are expensive items, it’s perfectly ok to change your mind after a while, sell the old unit and get a new one of a different kind. It is very important to store the fuel for your RV generator in a safe manner. Although propane is more flammable than diesel and gas, all three types are condensed forms of energy. We use them to burn them, in the end. And you want to make sure that process takes place within the secure confines of your generator – not elsewhere in your RV! Below is a list of tips to help you stay safe. Do not store fuel in anything but an approved container. Gasoline and other petroleum products may react with many types of plastic which could cause an unsafe condition. Different There are different colored fuel containers for each type of fuel. Containers for gasoline are commonly red, while containers for diesel are brown. Do not store portable fuel containers inside your RV or your residence. Store your fuel in a separate building or shed. 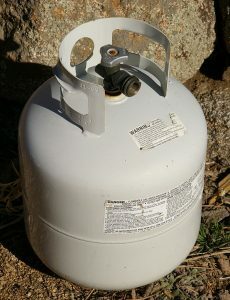 When you need to transport portable propane cylinders or fuel containers in your RV on camping trips, place them in an outside cabin away from any source of heat or ignition. Make sure any tanks you carry are closed and not leaking. To be sure, sniff the top of the canister and/or spray it with a little soapy water to make sure it sealed correctly. There will usually be a little odor for a minute or so after disconnecting, but it should quickly go away. You can test it with soapy water to be sure. If gases are escaping, the soapy water will bubble. If you carry fuel in an enclosed trailer you need to make sure the cans are tightly closed and that you leave some ventilation in the trailer (windows and/or roof vents) so fumes from any spills or leaks from gas cans will dissipate before they reach the flash point. The government regulates the release of gas fumes into the environment and according to the Environmental Protection Agency (EPA), gas fumes produced inside the tanks of RV generators must be captured and returned to be burned. EVAP generators are now designed to meet these regulations. Typically, motorized RVs already have a built-in system that complies with these regulations, but most tow-behinds don’t. 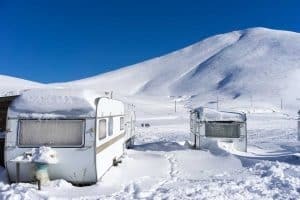 If you have a tow-behind RV such as a 5th wheel or a travel trailer, you will need to install an EVAP generator, certified hose, special fittings, a specially designed metal tank, and a carbon canister in order to compliant. If your system is missing any one of these certified EVAP components, you could be stopped by law enforcement officials and fined. Unless your gas RV generator pulls its fuel from the fuel tank, you’ll want to be sure you’re compliant so that this does not happen. Weigh Your Options- Then Go For it! Making the decision to purchase a generator for your RV can be difficult. However, if you consider the information provided above you should easily be able to make the determination, and be off on your next adventure before you know it! And don’t forget to leave us a comment and let us know which generator you have in your RV and if you’re happy with your current choice. Next PostWhat is the Average Gas Mileage for an RV?